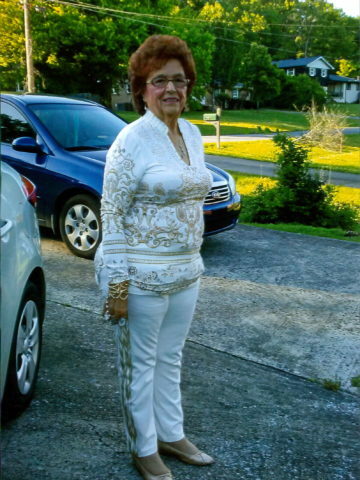 Mrs. Marie Brown age 82, of Hendersonville, TN, passed away on Sunday, January 27, 2019. Mrs. Brown was born in Carthage, TN, on January 27, 1937. She was a member of the Old Hickory Order of the Eastern Star #203. Mrs. Brown was a care giver. She enjoyed dancing and music. In addition to her parents, Mrs. Brown was preceded in death by her husband, Billy Lee Brown. Survivors include her three children, Joe Wayne Mabrey, Patricia Cline and her fiancé, Ricky Lamb, and Michael Heflin; two grandchildren, Courtney Dillard and her fiancé, Terry Youngblood) and Amber Mabrey; and two great-grandchildren, Haleigh Fisher and Caden Thomas. A Celebration of Life will be held Wednesday, January 30, 2019, at 2:00 P.M., Hendersonville Funeral Home with Pastor Willie Acevedo and Buddy Frank officiating. Entombment will follow at Hendersonville Memory Gardens Mausoleum. Gathering of Family & Friends will be Tuesday from 4:00 P.M. until 8:00 P.M. and Wednesday from noon until the funeral hour at Hendersonville Funeral Home. The Old Hickory Order of the Eastern Star #203 will have a ceremony starting at 7:00 P.M. Tuesday. Visit the online obituary www.hendersonvillefh.com to post tributes and share memories. My prayers are with them at this time. She was one of a kind for sure. I hate our families had difficult times in the last few years. May she Rest In Peace. Marie may be gone from our sights but not from our hearts! We love you Marie. Prayers for the family during this difficult time. I am so sorry to hear about your loss.. Thinking of you in these difficult times my thoughts and prayers are with the family wishing all hope in the midst of sorrow, comfort in the midst of pain Marie Brown will be in our hearts and memories forever. Marie was my very best friend an I will miss her so much.sending many prayers to her family. Marie was a wonderful caring lady. She will be missed by all who knew her. Love u my partner in crime and my heart aches. .I will always have u in my heart….I love all our memories….and will cherish them……see u again one day. My precious friend I knew you for quite a while. The years I knew you will be a precious memory. I love you and will miss you so much. Rest in peace my friend. Someday we will see each other again. I have known Marie since the mid-70’s when I became friends with her son Mike in junior high school. I am sorry to hear of her passing. She was a nice lady.